This introductory guide offers innovative ideas and strategies to students undertaking their first social science research work. 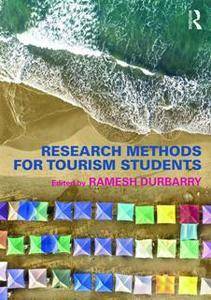 Academically rigorous yet accessible, it uses a systematic step-by-step approach to illustrate the research process and its applications to the tourism industry. Students are presented with numerous examples and case studies, linking theory with practice. The textbook provides a balanced coverage of both qualitative and quantitative methods, accompanying students throughout the process of selecting a research topic and specifying research questions, aims and objectives. A range of pedagogical features such as discussion questions, practical tips and examples enable students to review the literature, understand models and methodologies, analyse and interpret data (quantitative and qualitative) and ultimately write up their findings. Featuring contributions by a group of academics with expertise in their respective fields, the book provides a comprehensive and engaging introduction to research methods. This is an essential resource to tourism students and will also be of interest to researchers in any social science subject.